Mandibeads: What do tattoos and mustaches have in common? 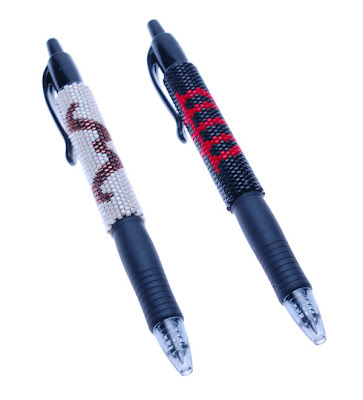 They can both be beaded on pens! The mustache pen idea developed during a craft circle (crafts and wine have created some awesome projects). Tamara of TP Design was making necklaces from 40 year old vintage velvet Christmas bows rescued from her parents house. She even added pearls and I wanted one really bad! So we decide to trade for a custom mustache pen that I am finally sending her way. She is a beautiful person and a ridiculously talented artist. Click here to visit her shop. I am envisioning an awesome product shot with the mustache pen. Very cool worthy mandibeads! Can I just tell you how much I love my pen and I haven't even seen it in person yet! Thank you so much for the kind words too, you are just as talented. Can't wait to see it. I will let you know when I get it! @Pam I think I should make another for my shop. There is great photo potential!